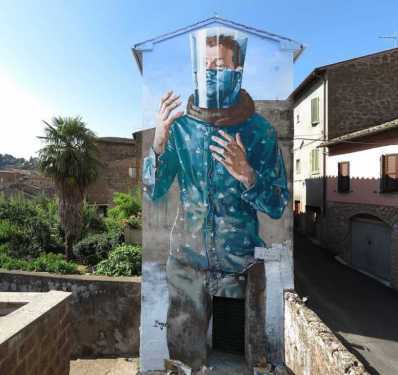 Drowning While Standing is an artwork painted by australian street artist Fintan Magee during the Urban Vision Festival 2017 (07-08 July), in Acquapendente (Lazio). Fintan Magee: << In 2016 a report released at the UN climate change conference in Marrakech stated that young people aged 18-25 say they are more concerned about climate change than the economy, terrorism, unemployment or any other issue. As rising sea levels, increased aridity and coral bleaching become a visible global reality it’s easy for young voters to feel ignored by politicians and policy makers who continually focus on the needs of baby boomers and older voters. As inaction on climate change continues many young people are being locked out of stable employment and housing while being forced to deal with rising education costs and rising sea levels. Many young people now feel unheard, disconnected from politics, and increasingly cynical about the future of the planet.